Face it, many of us have once played robber and bandits, or have ran around using plastic toy guns, imagining great battles, fighting a war, or perhaps even saving the planet from ghoulish and extraterrestrial invaders. In the end, we gave up on these childish fantasies, not purely because we didn’t like imagining great things, but because the plastic toys started to lack something, namely a sense of realism and grandeur. Well it seems that those days are over now that Goliath has brought their own GPS Laser Tag came on the market. We were lucky enough to try out the starter set, and after mere minutes, we were locked and loaded. Upon opening the box of the Starter Set we were greeted by two very good looking Spitfire pistols, a Wi-Fi hub and two mounts/clamps to attach to the pistols in order to be able to place your smartphone in the mounts. The pistols look great in their all-white glory with orange details to spice them up a bit, as well as a few influences of grey. It’s easy to spot the interactable portions of the weapon, as well as the location as to where you can attach the mounts and also where the sensors are placed. Overall the set looks spiffy, a bit futuristic and not at all cheap, which is probably why you will pay a reasonable amount for the Starter Set. Another added bonus is that the guns have some weight to them, making them also feel more expensive, rather than a scrapheap of cheap melted plastic. Before diving into the fun, you’ll need to download the app for the Recoil guns, which takes up around 70mb of space on your phone. The app itself is quite simple, as you’ll simply have to turn on Bluetooth to connect to the gun, Wi-Fi to connect to the hub and you’re pretty much good to go. The clamp can be used easily to attach your gun, and it has rubber padding, ensuring no damage or scratch marks to the body of your phone if you don’t have a protective cover in place. The app will then allow you to pick the game type and then you’ll be sent to the lobby, allowing other players to join. After that you’re pretty much ready to go, and you’ll start playing in a matter of seconds. The app will show you what your HP is, where enemies are located, where loot crates drop and so on. Overall the app will serve as your HUD when playing the game, while you still have to look at your surroundings, rather than keep an eye on your screen at all times. Your ammo count can also be found here, allowing you to properly time (the slow) reloads. It’s fun that these toys also give you a sense of realism outside of running outside/inside and actually aiming at people in the physical world. You also have a bit of force feedback on the guns, making it so that they vibrate and give you a little ‘kick’ when you squeeze the trigger. Nonetheless, we noticed a few small differences in the sound and abruptness of the two different guns, while it should actually be identically the same. We hope this was just a little mishap that, according to us, didn’t have any real effect on the playing sessions. Targeting works pretty much just like any other laser tag game, but in this case you’ll be aiming for the weapon of your enemy, making the hitbox slightly smaller than it would in any other game. You can play the game with up to sixteen players, granted you have as many guns, which is certainly nice, as you can play team based missions, as well free for all skirmishes. We couldn’t try out the game with more than two people, as we only had the Starter Set at our disposal, but if the game works as good with more players as it currently does, we can only be impressed. You can easily walk away several meters from the Wi-Fi hub, more depending on the amount of walls blocking the signal and the position of the hub itself. It’s best to have the hub on slightly higher ground, rather than on the floor level. Outside of the already reasonable amount of functions, the sturdiness of the weapons and the impressive player count, you also have an audio chat option, which is pretty awesome to have for a (team based) game such as this. While for some this might only be a gimmick, one you not always use because it might block out the sounds of your surroundings, it’s a very impressive option to have when playing with ‘toy guns’. 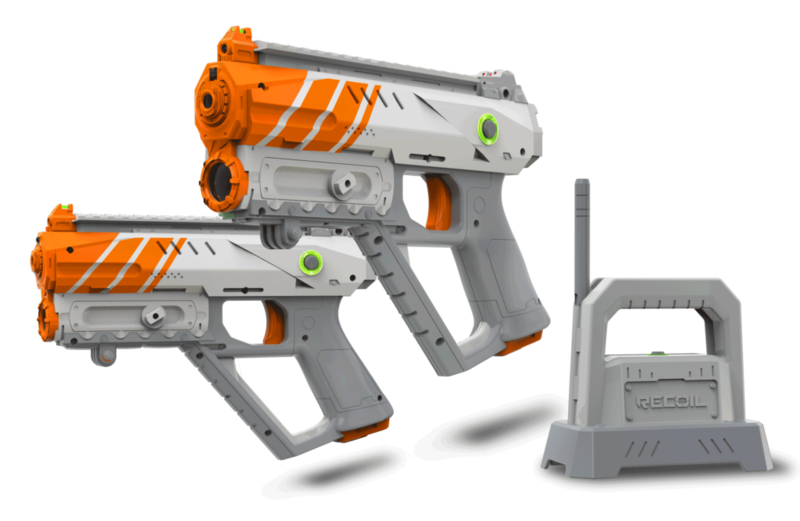 While Goliath’s Recoil Start Set might be a bit pricey, it’s a fun investment that allows you to play a laser tag game inside as well as outside. If you can find a reasonable group of players, all wanting to invest something in these adventurous toys, you might have yourself a proper battle royale in your own backyard. If you’re still on the fence for this one, or you don’t have a big budget to spend, it’s still a toy worth considering, for both young and old. We loved the design, the handling, the force feedback and the overall concept.